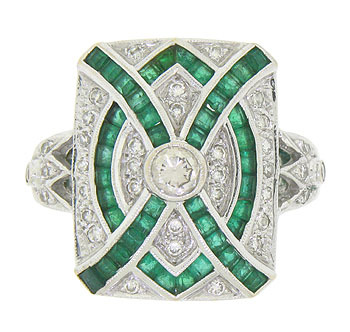 This stunning 18K white gold diamond and emerald estate engagement ring features a central bezel set diamond. 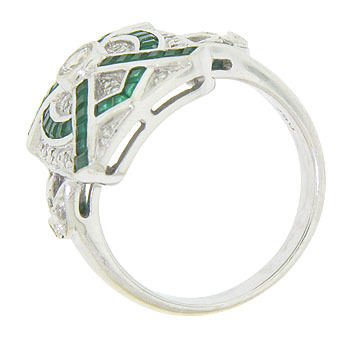 Strings of square cut emeralds stretch across the face of the ring, while a marquis figure set with additional square cut emeralds decorates the rings surface. 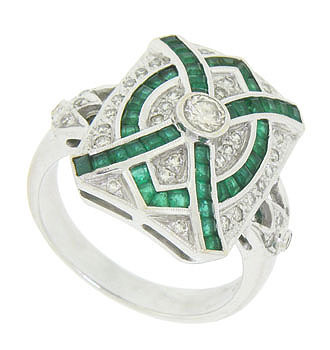 Fine faceted diamonds fill the negative space between the rich green emeralds. Organic floral figures set with round cut diamonds adorn the shoulders of the ring. 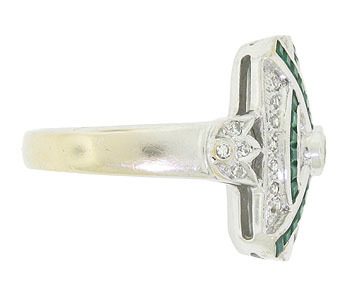 This phenomenal ring measures 17.88 mm in width. Circa: 1950. Size 6 3/4. We can re-size.